STAY CLOSE TO GOD! What an uplifting reminder of the Lord's promise to those who diligently practice His Presence! 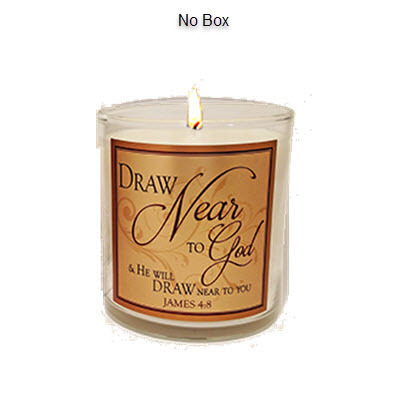 We chose the deep exotic fragrance of SPIKENARD for this candle with the Scripture: "Draw Near to GOD & He will Draw near to you" (James 4:8), as it represents intimacy with the Holy One. Hand-poured in Abba's facility in our eco-friendly soy blend wax, it has an approx. burn time: 26-30 hours and is 8.7 oz by volume. Container can be used with votives or tealights for continued delight.